The primary goal of this course is to provide Sport Club Administrators with the knowledge and skills needed to manage the challenging and multi-faceted area of Sport Clubs. Since risk management for participants is a key concern for all Sport Clubs Administrators, the course will focus on how to develop an operational ‘framework’ for Sport Clubs to facilitate better oversight and management – and help ensure a safer environment for Sport Clubs participants. Course assignments are project-oriented and designed to address key issues in your program (only 2 main course assignments per week). Sport Clubs are initiated and managed by Club members with the primary role of the University being to support, assist and advise the student leaders. The key to a successful Sport Clubs program is strong student leadership and involved University support. Safety of Sport Clubs participants is a key concern for Campus Recreation departments across North America. Insufficient oversight of Sport Clubs coupled with autonomous operational structures has the potential to compromise the safety of Sport Club participants. By implementing a realistic operational ‘framework’, administrative oversight by qualified professional staff can assist clubs in following University policy and provide a safer environment for Sport Club participants. The Sport Clubs framework provided by this course focuses on the key areas of Sport Clubs Operations, Administrative Management Systems, Travel and Risk Management. Develop a framework to effectively manage Sport Clubs. 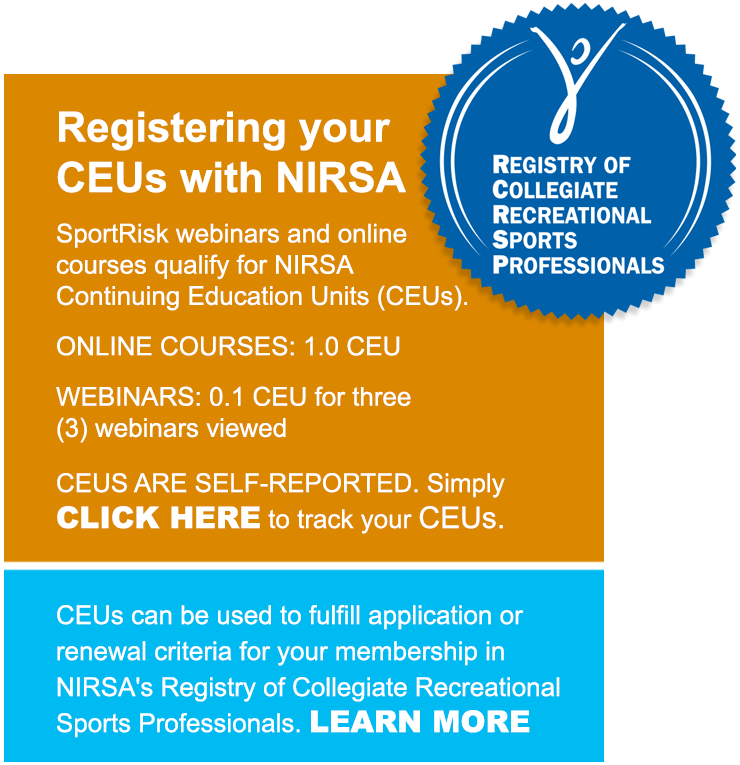 Establish Sport Clubs criteria and a registration/ renewal process for Sport Clubs. Learn about different leadership styles and how to educate various communities about incorporating the styles. Learn the key components of a Sports Club Operation Manual. Develop an operational framework which allows for student development while maintaining a clear line of administrative oversight. Identify the key players in the Sport Clubs Travel process. Develop an effective Trip Approval process. Understand the importance of waivers in Sport Clubs and how to develop and effectively implement waivers. Develop good practices around the provision of first aid/ sports medicine/ training services to Sport Clubs athletes. Learn the benefits of establishing key on-campus relationships and an effective ‘Sport Clubs Network’. This is a 4 week course. Course work and assignments should take approximately 3-5 hours per week. No course text. Reading material will be provided. Who is Course aimed at? The course is aimed at Sport Clubs professionals who are looking to implement a simple, practical and doable Sport Clubs framework — or are seeking ways to improve and better manage their current program. Content is applicable for professionals new to Sport Clubs management; seasoned professionals can also benefit by using the course to ‘audit’ their current program. There will be extensive networking opportunities and you’ll see what other programs are doing across North America. ‘Real’ project assignments are geared towards Sport Clubs issues specific to your campus. The Risk Management Best Practice program provides institutionally-specific feedback allowing our University Recreation department to prioritize areas for improvement to enhance the safety and well-being of our participants. The thorough analysis by areas of operations provides our staff tangible information to determine our next steps and most effective course of action. This feedback would take much longer and be less objective if we attempted to undertake the reviews on our own. The comparative data is good for learning trends in best practices of other institutions.